We’re closer to the next lingerie trade show (February 25-27) than the one I’m writing about (last August! ), but here’s an upside: these pieces are already–or soon to be–available for purchase. I don’t know what made me more excited–reviewing my photos of all the pretty and fun full-bust bras and swimwear coming our way, or the fact that we don’t have to wait six months to be able to buy them! Leah posted her great Panache roundup back in August, so take another look if you’re making a shopping list. Here’s what caught my eye from Curvy Kate and Scantilly. I adore the shimmery lilac color of this Lifestyle plunge that will be available in February (black and latte are continuity colors). It’s available to a J cup in 30-40 bands. This will actually be the style for all Curvy Kate plunges going forward, so you can know how all their other plunge bras will fit based on how this one works for you. The teal Ellace comes out this month (black/champagne and white are continuity). It’s available to a K cup in 36-40 bands, to a J cup in 32, a JJ in 34, and a G in 42 and 44. I really like this streamlined babydoll from the new “In Love with Lace” line. Available this month, it goes to a J cup in 30-40 bands and a G in 42 and 44 bands. The new full-cup DelightFull comes out in February. It’s available in 32-34 G-K, 36-40 F-K and 42-46 DD-G..
Curvy Kate has added “cushion comfort” tabs at the end of the underwires for a more comfortable underarm. (I was told that simply shortening the underwire would cause spillover.) Here are a couple more special features about this bra: (a) there’s a crossover beneath the bridge that helps reduce discomfort at the base of the center gore; (b) the band is composed of a firmer powerknit for more support; and (c) the front straps have been moved in toward the center so they’re not as wide. 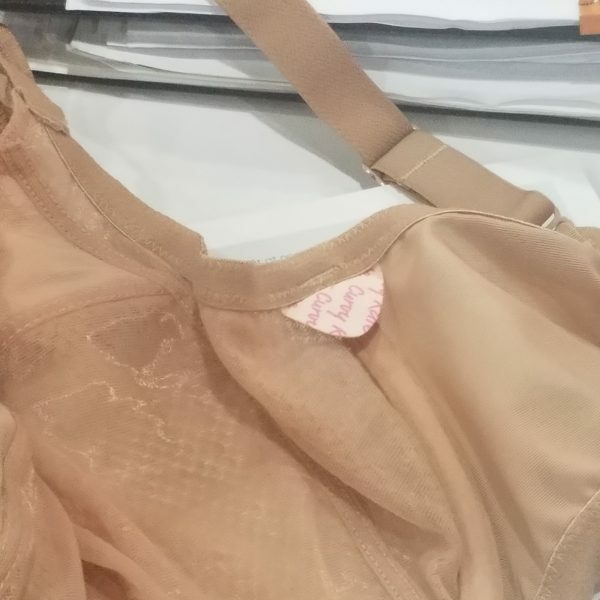 There’s another bra coming out in April called the BlissFull that also has the comfort cushions–except it has no band, which makes it better for shorter torsos. The Indulge Me bodysuit from Scantily with its plunging keyhole came out in November. I like the back fastening. The straps can also be criss-crossed. By the way, this model wears a 32FF and is wearing Indulge Me in size L (it’s available in S-XL). Encounter comes out in April in 30-40 DD-HH. Heart Throb came out in November, and some sizes sold out right away. 30-40 DD-HH. Finally, meet DeLuxe, a dressier version of the Luxe. The high-waist brief that comes with this set has removable suspenders. Available in black, it comes out this month. « GG Musings: I Love the Full Body Scanner at the Airport!